Order the book at Amazon here. or order the book from Four Way Books here. 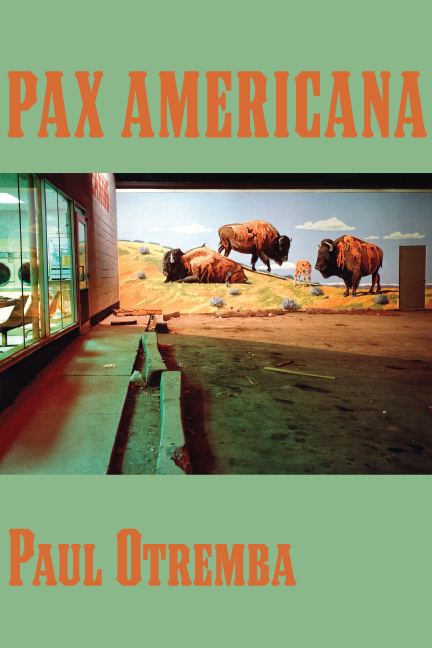 Paul Otremba’s Pax Americana, a book-length sequence of poems, has tremendous reach. From the tiniest evidence of civilization (“a whole way of life expressed by the way / you hold a fork”) to the largest imaginable manifestation of the perceived world (“sometimes there’s not even / the train or people at all / there, or even the city, the planet, / the whole swirling / mess of gasses and ice / and cosmic blind spots, gone”), Otremba presents an anti-hero’s take on a fallen world that seems to be hurtling farther downward still with a Dantean insistence. The language struggles with the man until an entirely unanticipated surge of romantic feeling engenders the belief that “we” (the lovers? all of us?) can found a “new city.” Much is owed to the power of Otremba’s writing, the physicality of which intensifies as the poems begin to turn away from the more abstract, ironic language (“so the end of history was beginning to look / a lot like history”; “I survived because I remained totally dead”), making this unlikely shift toward hope credible, transforming even. And that this new feeling is so hard-won–it comes very late!–that gives the key turn force, distinguishing the book. In the disquieting America brought to life in Paul Otremba’s poems, everyone is guilty. Public malaise and private conduct blur into each other, making both the empire and its citizens complicit in “the continuous fattening / of the bubble.” But more than just sounding the alarm, Otremba upholds the poet’s task of identifying meaning out of the glut and spectacle that would otherwise merely define our times. In a strange lyrical frequency that is all his own, full of irony and beauty, Otremba has written a book that we deserve and need.